Home » » What's Your Norm? 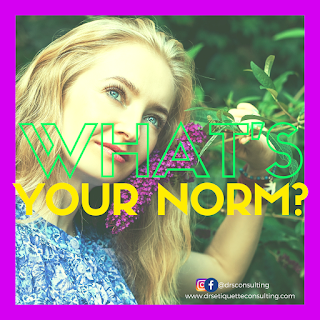 What is your norm? Where do polite, respect, kind and considerate moments appear in your day and how frequent are they? My guess is that many of us will have a hard time answering that question. My own norm is to make my behavior very sweet. With classic behavior thrown out the window in our society, it's been hard maintaining refined disposition. In my daily life, I try with an intention to choose kindness over violence, compassion over cruelty, and action over indifference. I believe good manners surprisingly offer sweet ways to respond and interact with people to get the best results in today's world. We spend so much time and energy focusing on the negatives that affect us. When a difficult, conflicting or angry moment appears, as I encourage me, I encourage you to put in the intentional effort to lower the emotional level by acting kindly. This act of thoughtfulness brings goodness and smile. We should all make good manners our norm to make the world a better place for everyone. Thank you for always valuing my invaluable thoughts. Much love to all. Damilola Ogunremi, DRS Etiquette & Image Consulting.